The final day of the field school at Glendalough saw quite a hectic start with many things needing to be done relatively quickly. With the main focus of the day being backfilling the students would have to wait until the afternoon to begin. All necessary plans were drawn with most of the students backfilling trench 10 which led into lunch. Throughout the excavations this trench has provided many questions and interpretations. The original interpretation of the protruding stones as once being a staircase which led to a tea house on the top of the bank has been changed numerous times throughout the two weeks. The result of our excavations suggests that the original stones may not have been related to the tea house. For the optimist, it has been thought that these may have once been a staircase leading to the monastery. Our interpretations are based off of a lack of pattern in the stones which would suggest a possible staircase. It also appears that the bank may have had its slope altered since the period in which the tea house once stood. 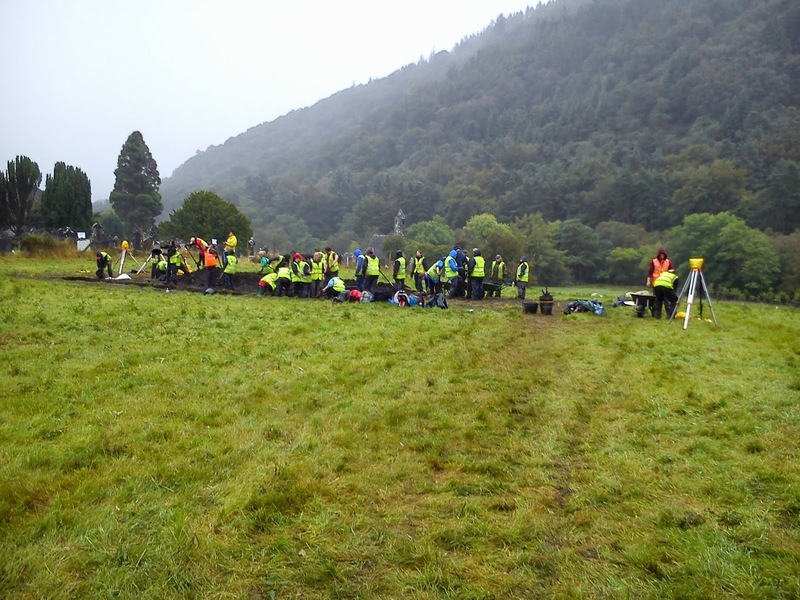 Our excavating has not shown to be unsuccessful however, as we learned an immense amount of information about the geological history of Glendalough. Finds from the trench have also given us an idea of the activities which had taken place throughout the centuries near the pattern bank. All of which will be examined further in post excavation. Trench 11 throughout the excavation has given us a constant source of archaeology. From possible Neolithic material to the most modern rubbish, the number of artefacts which came from trench 11 was quite substantial. With many questions left to be answered it's likely that the excavations will continue on next year to further our already developing understanding of the trench. It appears we located the ditch which appeared in the geophysical survey from 2011. Numerous postholes and stakeholes were located throughout the western and eastern sections of the trench, one of which was nicely held in place by surrounding stones. In the second week a sondage was placed running east-west along the northern side of the trench. It had been placed strategically in order to pick up the possible structural feature as well as the ditch. While this year we were unable to completely unearth the structure we have reached a possible feature which can answer more of our questions in the years to come. Trench 12 has definitely been one of the more interesting trenches solely due to the vast amount of questions and answers we have received. With the excavations over the students had been presented with a range of possible features throughout the entire trench. Some broken patterned soil indicates agricultural furrows, while others have led to the discovery of the possible ditch feature picked up by the geophysics. Two weeks of finds has indicated a range of activity ranging from possible Neolithic to the medieval period. Modern finds uncovered include modern ceramics, clay pipes and modern glass shards. Medieval artefacts ranged from pottery to floor tiles with a small amount of flint artefacts possibly from the Neolithic period. All finds are to be sent back to ucd for further analysis. From further studying of these objects we can learn more about many different aspects of this area in the glendalough landscape. 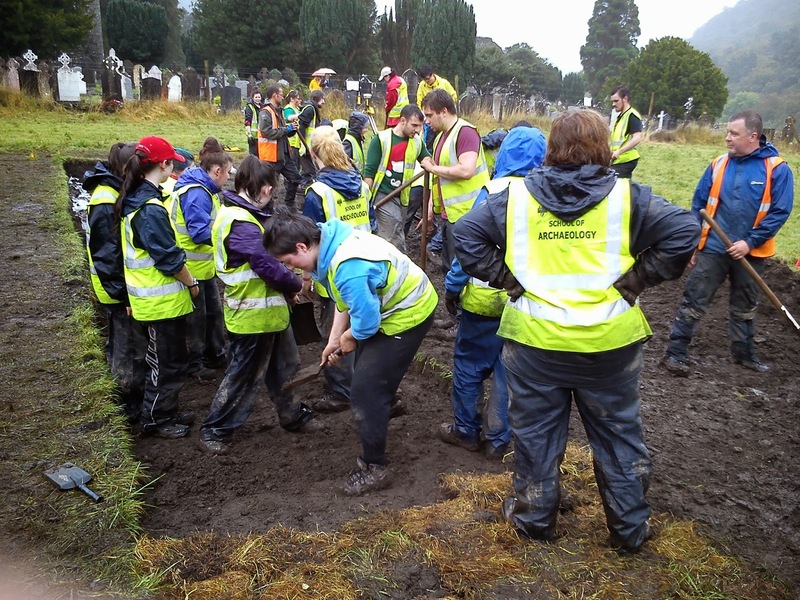 Our archaeological adventures as Glendalough ended with a large amounts of backfilling and fun. With all the students acting as a team trenches 10 and 11 were fully filled in with trench 12 left for a later date. Through rain and sun all members of the team, both student and supervisor took part in the backfilling process with some... Messy results! All in all the excavations ended with a bang, leaving much more to learn in next years field school.